This is a more luxurious version of coif, embroidered in coloured silks, embellished with precious metal threads and freshwater pearls. The repeated motif of a snake with a rose and floral sprigs may have been inspired by the visual images in popular emblem books. Until the end of the 17th century the coif was informal headwear for women. Plain linen versions were worn by the working-class. Middle-class and aristocratic women wore elaborately decorated coifs. It would have been worn by itself indoors, or with a hat on top in public. In Western Europe it was customary for both men and women to cover their heads in public up until the 1960s. A hat was an essential part of respectable dress and, from a health perspective, head coverings were considered necessary to protect against chills and disease. 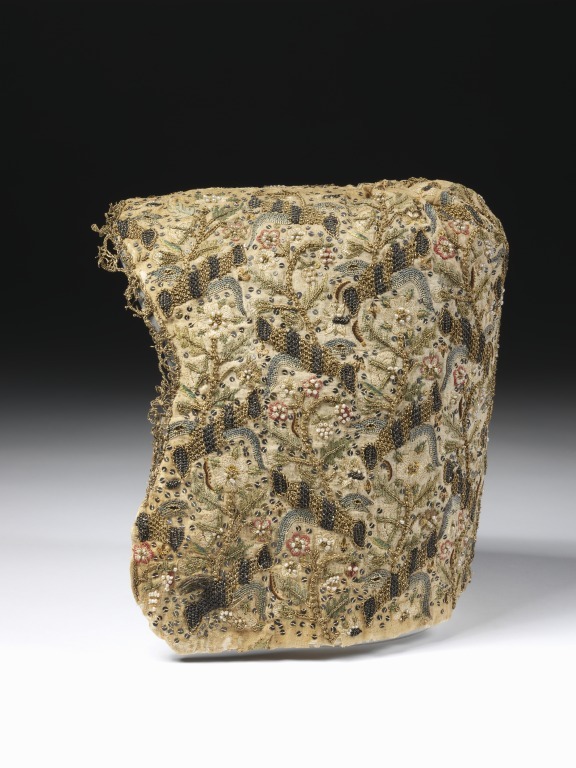 Woman's linen coif embroidered with coloured silks, silver and silver-gilt threads in satin, chain, detached buttonhole stitch and plaited braid stitch, and with silver-gilt spangles and freshwater pearls in a repeating pattern of flowers and a snake. 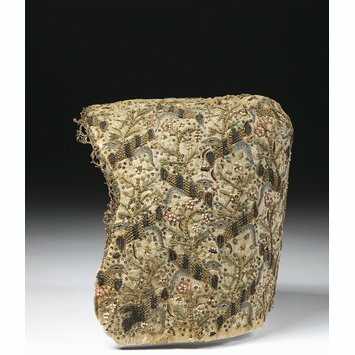 Along the front edge are remnants of silver-gilt bobbin lace. 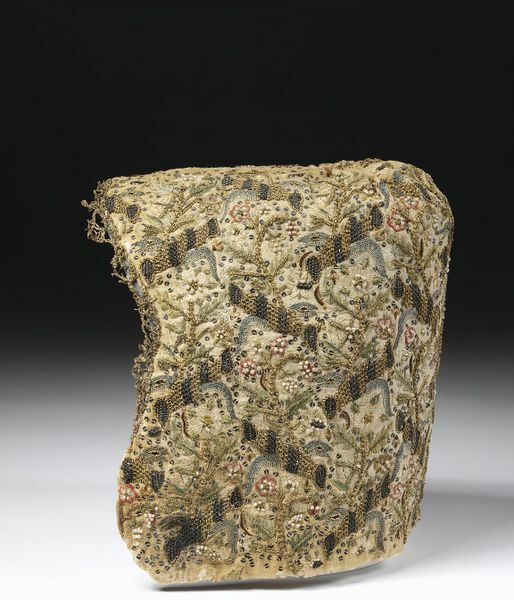 Later conservation work includes re-backing the coif on cotton and re-stitching the top seam. Lined with muslin. Length: 22.2 cm approx., Width: 20.5 cm approx. Men wore nightcaps when relaxing at home, in contrast to more formal headwear worn for public business during the day. The informal head covering for women was the coif. For the wealthy, these could be highly decorated with expensive metal thread and are of great beauty.